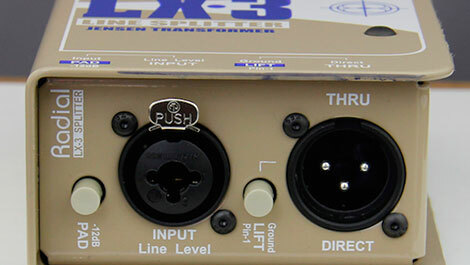 The input of the LX2 features an XLR/TRS combo jack for connecting balanced or unbalanced line level signals to be split to two different destinations. A premium Jensen transformer inside provides 'exceptional frequency response and phase coherency to ensure that the highest audio quality is maintained', while isolating the two outputs from each other to eliminate hum and buzz from ground loops. Ground lift switches on each of the two XLR outputs help to further reduce ground loop noise. Designed with heavy-duty 14-gauge steel construction, the LX3's book-end design creates a protective housing around the connectors and switches to prevent damage even in a harsh concert touring environment, and an internal I-beam frame makes it 'almost impossible' to torque the circuit board and damage solder joints.